Mega Sale! Free Shipping Included! Save 26% on the Cosco Shifter 300-Pound Capacity Multi-Position Heavy Duty Folding Hand Truck and Dolly, Green by Cosco at Enria Industries. MPN: 12-222PBG1E. Hurry! Limited time offer. Offer valid only while supplies last. 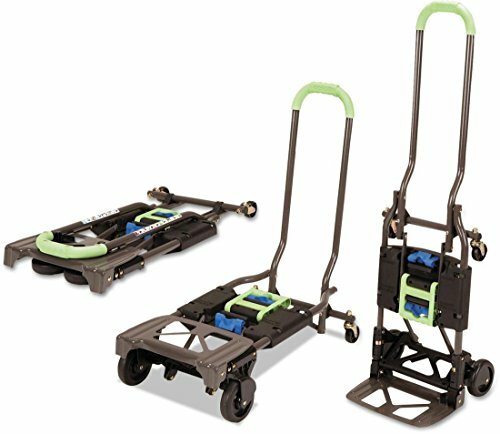 4-wheel, Truck or Dolly and a 2-Wheel Hand Truck all in one! What's better is it folds up and only weighs about 15 pounds, so take it anywhere. 4-wheel, Truck or Dolly and a 2-Wheel Hand Truck all in one! What's better is it folds up and only weighs about 15 pounds, so take it anywhere. Whether you are moving boxes or unloading the car; simply unfold the Cosco Shifter and let this lightweight hand truck do all your heavy lifting. The Shifter easily converts from its flat storage position to a 2-wheel upright hand truck or 4-wheel cart with no pins or tools. The flat folding design makes it easy to store in a closet, the garage, or even the trunk of your car. View More In Hand Trucks.